It’s written with the + symbol, but we say Google Plus. You can get to it on a web browser by going to the address: www.plus.google.com. If you use Gmail, you can also get to Google+ by clicking on the link to your name with the + sign in front of it. Google has been around for a long time and it has grown by adding more and more services over the years. Starting as just a search engine, the software and services they now offer is quite a long list, including Gmail, Youtube, Picasa and Picasa Web Albums, Maps, Drive/Docs, Calendar, and Earth. It was possible that you could create a separate account for each of these services. With Google+, they are trying to get us to clean up our accounts and just use one. That one account should represent the real us, and we can use it to log in to all the different Google services. If you created a Google account (by signing up for Gmail, or any of the other Google services) within the last couple years – it IS a Google+ account. Because Google+ is Google! If your Google account was created before the advent of Google+ then you will have opportunities to “Upgrade” your account by Joining Google+. Just visit www.plus.google.com and you will see a form to fill out to Join Google+. It’s all free. What do you get by joining Google+? A system of people, and streams of content where you can share stuff with the public, or with ‘circles’ of friends, acquaintances, and business associates. It’s like Facebook – but more. The Google+ sharing system is a “Social Layer” that runs thru all the other services. You can also ‘follow’ the posts of people or businesses that you are interested in – kinda like Twitter, but more. An online photo management system. Google+ Photos also has Apps for your Apple and Android phones and tablets so you can see your pictures anywhere, anytime. A video teleconferencing system called Hangouts, and the broadcast option called Hangouts on Air. We think Google+ Hangouts on Air are revolutionary communication tools. With just a computer, and an Internet connection, anyone today can have the equivalent of a worldwide television production for free. Hangouts on Air is what brought us into the Google+ world. That is how we are producing our weekly show, in it’s 6th week now. Hangouts on Air is a free platform uniquely capable of presenting teaching to large groups of people anytime, anywhere. 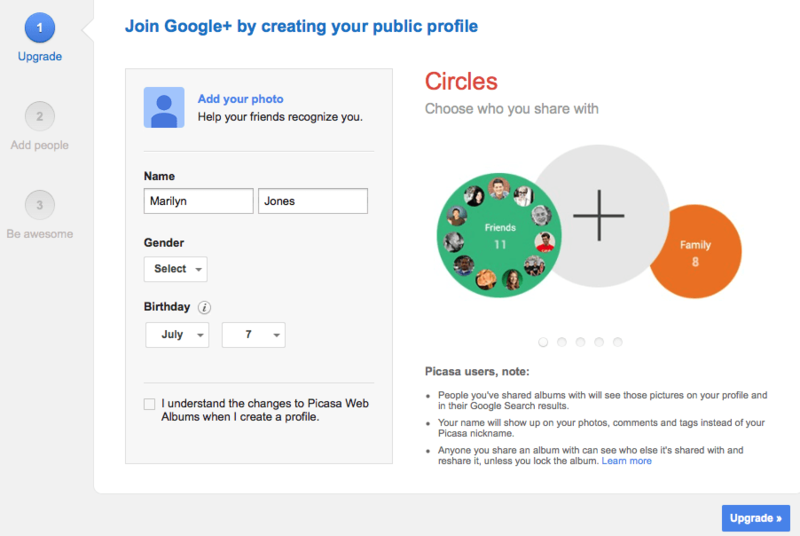 If you want to learn ALL about Google+, we recommend Martin Shervington’s What is Google Plus, A Complete User’s Guide. It includes several hours of video as well as written explanations. First of all, we don’t see it as an alternative to Facebook for personal use. All our friends are on Facebook, and we use Facebook to keep in touch with our friends. We don’t see that changing. When we communicate on Facebook, we keep our privacy settings to “Friends Only.” However, we might be seeing Google+ as an alternative to our Facebook Geeks on Tour page. We have not been happy about how Facebook delivers (or not) our page content to the people who have “Liked” the page. Reports show us that less than 10% of them ever see our posts – and we’re not alone. Google+ seems to be much more friendly to businesses. And, think about it … who owns the search engine? Most everything we post using Google+ is designated as Public. Free storage for all our photos – and I have uploaded 30,000 of them! I have fun with the Auto-Awesome creations it makes, especially HDR. And, I love the way it displays my pictures. I use it the same way I’ve used Picasa Web Albums for many years – just upload pictures from my computer using the Picasa software on my computer. We love the idea of being able to have a weekly show. It is Hangouts on Air that makes it possible. And, as soon as the live show is over, it is recorded as a Youtube video on our Geeks on Tour Youtube channel. We hope that our Geeks on Tour Google+ Page will eventually become what our Facebook page did not – a central point for promotion and discussion of all things Geeks on Tour. What is it that people don’t like about Google+? The social network part of it is interwoven with all the other services. So, for example, you may keep using Picasa the way you always have but then notice that, in addition to creating a web album, the picture(s) have also been posted to your Google+ Home page or “Stream.” If you didn’t understand that, it can be confusing and annoying. You don’t have to use the social network part of Google+ but you have to learn how to use it in order to avoid it! When you post to your Blogger blog, a notice can automatically get posted to your “Stream” in Google+. This is wonderful if you want and understand it, but quite disconcerting otherwise. Account confusion: Many of us have multiple Google accounts from long before Google+ existed. That adds more layers. If Picasa is trying to upload pictures to one account, and your web browser is logged into another account, you’ll get an error message when you try to look at the pictures you just uploaded. It takes some effort to get it straightened out. It’s constantly changing. I don’t think even Google knows exactly what Google+ is! It started in 2011 – only 3 years ago. The person who created and was in charge of Google+, Vic Gundotra, left Google in April of this year and there has been no clear direction or vision since. Every time I use one of the Google+ tools, there are different commands available and others have disappeared. We promise to keep learning and sharing with you. Published by MrsGeek, in Blog. Tagged with google. Chris, thanks for another excellent and timely post on Google. Coincidentally I have a class coming next week I’m calling Indispensable Google Services, and you helped flesh out outline for me. Awesome! Thanks Chris, I appreciate your ability to present this in such an organized manner. I have ranted and raved about the changes but have continued to be fascinated about the potential. I have to work to be comfortable but it has unbelievable features. Like Google+ I am a work in progress. You don’t mention privacy or security. I don’t like the fact that Google collects information on people and the more information I have in one place the easier it is for them to put 2 and 2 together. P.S. We all love Geeks on Tour , and thank you for it . hi,i dont like facebook,and i really dont want to join google+.ive been using picasa a few years now and ive also put many of my friends on it.i pay google every year for extra storage for my photos.thing is google want to take over everything they keep trying to ram google+ down my throat.i know that very soon they will close web albums so as to force everyone to join +,when that happens ill close my google account.why cant google leave well enough alone,i know im not the only one to think this.i love geeks on tour keep up the great work,do you think you will ever make it to dublin ireland where i live.ps….please google leave web albums alone,please..